This article is about the website. For the fruit, see Calabash. For the similarly named dance, see Hula. Hulu website screenshot taken on 26 July 2009. "For the Love of TV"
Hulu Plus membership is required. Hulu is an American subscription video on demand service owned by Hulu LLC, a joint venture with The Walt Disney Company (through Disney-ABC Television Group) (30%),  21st Century Fox (through Fox Entertainment Group) (30%), Comcast (through NBCUniversal) (30%), and as of August 10, 2016, Time Warner (through Turner Broadcasting System) (10%, minority stake). It is primarily oriented towards television series, carrying current and past episodes of series from its owners' respective television networks and other content partners. It was previously divided into free and paid tiers, with the free service limited in the amount of content accessible by users and is accessible via PC only, and a paid service with a larger library of content and access via Hulu applications for various mobile and connected devices. The subscription service is, in turn, divided into advertising-supported and mostly ad-free tiers. In 2016, Hulu spun out its free content into a joint venture with Yahoo!, Yahoo! View, and also announced that it intends to launch a service with live television programming some time in 2017. In Mandarin, Hulu has two interesting meanings, each highly relevant to our mission. The primary meaning interested us because it is used in an ancient Chinese proverb that describes the Hulu as the holder of precious things. It literally translates to "gourd", and in ancient times, the Hulu was hollowed out and used to hold precious things. The secondary meaning is "interactive recording". We saw both definitions as appropriate bookends and highly relevant to the mission of Hulu. Key executives instrumental in the founding of Hulu include Bruce Campbell, Peter Chernin, JB Perrette, Michael Lang, Beth Comstock and Jason Kilar. The venture was announced in March 2006 with AOL, Comcast, Facebook, MSN, Myspace, and Yahoo! planned as "initial distribution partners". Kilar was named the CEO in June 2006. The name Hulu was chosen in late August 2007, when the website went live, with an announcement only and no content. It invited users to leave their email addresses for the upcoming beta test. In October, Hulu began the private beta testing by invitation, and later allowed users to invite friends. Hulu launched for public access in the United States on March 12, 2008. The first product to launch was the HULU Syndication network, which was designed and developed by the NBC Universal team from New York, on October 29, 2007, followed by the Hulu.com destinations site. On June 21, 2011, The Wall Street Journal reported that an "unsolicited offer" caused Hulu to begin "weighing whether to sell itself." On October 13, 2011 however, Hulu and its owners announced that they would not sell the company, as none of the bidders offered an amount that was satisfactory to its owners. It was reported that in 2011, Hulu made $420 million. The figure was $80 million short of the predicted revenue. The vacant CEO post was officially filled by former Fox Networks President Mike Hopkins on October 17, 2013. In May 2016, Hulu announced that it planned to begin offering an over-the-top IPTV service with "live programming from broadcast and cable brands" some time in 2017. On April 30, 2009, The Walt Disney Company announced that it would join the venture, purchasing a 27 percent stake in Hulu. On October 28, 2011, Hulu announced that they had inked a five-year deal with The CW, giving the streaming site access to next-day content from five of the six major networks. On September 18, 2013, Hulu announced a multi-year deal with the BBC that will deliver 2,000 episodes from 144 different titles in the first 12 months. In 2015, Hulu began offering content from Showtime for an additional $8.99/month, still cheaper than Showtime's own streaming service. CBS remains the only major network not offered on Hulu despite offering CBS-owned Showtime and CBS co-owned The CW. On June 16, 2016, Hulu announced a deal with the Disney-ABC Television Group for the exclusive SVOD rights to past seasons of seven Disney Channel, Disney Junior and Disney XD series, and more than 20 Disney Channel original movies. The Hulu monthly subscription service called Hulu Plus was launched in beta (preview) on June 29, 2010 and officially launched on November 17, 2010. Like the free version of Hulu, the content available with a Hulu subscription also contains advertising. However, it offers an expanded content library including full seasons, day-after access to current season content and more episodes of shows available through the free Hulu. A Hulu subscription also provides a wider array of viewing choices. The free-access to Hulu was only available on PCs and laptops, while a Hulu subscription allows viewers to access Hulu through all Hulu-supported devices including set-top boxes, smart TVs, gaming consoles, mobile devices and more. A little more than a year after the launch of the Hulu subscription service, the number of paying subscribers reached 1.5 million. In May 2016, Hulu reported it had reached 12 million subscribers. Viewership numbers for the site are tracked by measurement firms such as ComScore, Nielsen ratings, and Quantcast. In partnership with comScore, Hulu is the first digital company to receive multi-platform measurement at an individual level that includes co-viewing for living room devices. When factoring this in, Hulu's reach among A18-49 increases 50 percent. As of 2016, 69 percent of Hulu viewing takes place on regular television sets through connected devices. Hulu distributes video on its own website and syndicates its hosting to other sites, and allows users to embed Hulu clips on their websites. In addition to NBC, ABC and Fox programs and movies, Hulu carries shows from networks such as A&E, Big Ten Network, Bravo, E!, Fox Sports 2, FX, G4, Ion Television, NFL Network, Oxygen, RT America, Fox Sports 1, Esquire Network, SundanceTV, Syfy, USA Network, NBCSN, and online comedy sources such as Onion News Network. Hulu retains between thirty and fifty percent of advertising revenue generated by the shows it distributes. In early March 2010, Viacom announced that it was pulling two of the website's most popular shows, The Colbert Report and The Daily Show, off Hulu. The programs had been airing on Hulu since late 2008. A spokesman for Viacom noted that "in the current economic model, there is not that much in it for us to continue at this time. If they can get to the point where the monetization model is better, then we may go back." In February 2011, both shows were made available for streaming on Hulu again. As of January 17, 2011, Hulu has streamed its own in-house web series The Morning After, a light-hearted pop-culture news show. It is produced by Hulu in conjunction with Jace Hall's HDFilms and stars Brian Kimmet and Ginger Gonzaga. Producing the show is a first for the company, which in the past has been primarily a content distributor. On January 16, 2012, Hulu announced that it would be airing its first original script based program, titled Battleground, scheduled to air in February 2012. The program will air on Hulu's free web service rather than on the subscription-based Hulu Plus. Battleground is described as a documentary-style political drama. Later that same month, Hulu announced it would air The Fashion Fund, a six-part reality series, and the winner of the show will receive $300,000 to start their career. To continue with its original programming movement, Hulu announced that there will be a total of seven original programs that are planned to air on its service: Battleground, Day in the Life, and Up to Speed were previously mentioned; and on April 19, Hulu added four more shows to its list: Don't Quit Your Daydream, Flow, The Awesomes, and We Got Next. Some of these programs began airing in 2012, while others will premiere over the next few years. On May 21, 2012, Hulu announced it would be bringing Kevin Smith to its line-up of original programming. Smith hosts a movie discussion show titled Spoilers, which began airing in the summer of 2012. On July 12, 2014, it was announced that Hulu had signed a three-year deal purchasing exclusive online streaming rights to the South Park library. Through the deal, the South Park Studios website became powered by the Hulu video and advertising experience. Along with this, the domain name changed from "southparkstudios.com" to "southpark.cc.com". Previously, the show had been removed from Netflix, along with other titles. The new site launch caused a few technical issues, but everything was fixed and fans are able to watch full, uncensored  episodes and clips again on southpark.cc.com and Hulu. For viewers outside the US, episodes and clips still stream through the “classic” South Park player and nothing changed aside from the new site design. A handful of countries have their own localized versions of South Park sites – fans in these countries can continue to watch episodes and interact with other fans exactly as before. It was announced that beginning in September 2014, following the premiere of the 18th season, only 30 select episodes will be featured for free viewing at a time on the website, with new episodes being available for an entire month starting the day following their original airings. The entire series is available for viewing on the Hulu subscription service. On May 14, 2015, AT&T struck a deal with Hulu that would give its customers access to streaming service on both regular and premium tiers. It should be noted that Hulu is known for streaming anime titles from many distributors, including Funimation, TMS Entertainment, and Bandai Visual, in addition to Viz Media. In 2013, Nippon Television Network Corporation (Nippon TV) acquired Hulu's Japan business. The transaction, which is subject to certain regulatory conditions, marked Nippon TV's entry into the SVOD (Subscription Video On Demand) business. Through the acquisition, the Hulu service continues to offer Japanese consumers premium content, including Hollywood and Japanese films and dramas and popular television programming. Additionally, Nippon TV's popular shows and original exclusive content launched on the Hulu service in Japan, expanding its content offering. Japanese users have access to a library of popular television shows such as the CSI franchise, Grey's Anatomy, Prison Break, and Ugly Betty, and as well as movies such as Armageddon, Men in Black, and Pirates of the Caribbean. In July 2010, the Financial Times revealed that Hulu had been working on plans for an international launch of Hulu Plus for several months, and had identified the UK and Japan as markets where its free website and subscription model could feasibly work. Hulu chief executive Jason Kilar expressed his belief that the US model could be replicated elsewhere, saying "We won't be satisfied until this is a global service." Hulu's first expansion into an international market took place with the launch of a service in Japan on September 1, 2011. Hulu is unable to launch in Canada due to the relative small size of Canada's online advertising market and because Canada's television networks already have the exclusive online streaming rights in Canada to several titles offered on Hulu, including many mainstream American television network programs. The absence of Hulu in the Canadian market raised concerns by fans of the sitcom The Mindy Project when it was cancelled by Fox in the spring of 2015 and subsequently picked up by Hulu; the show's Canadian broadcaster, City, subsequently announced it would continue to air the series in Canada. At present, Canadian consumers have access to several other streaming systems, including a Canadian version of Netflix, Shomi, CraveTV and Crackle, but with both Shomi and CraveTV streaming some programming from inaccessible-to-Canadian-viewers platforms such as Hulu and Amazon. ↑ "NBC Officially Owns 32 Percent of Hulu". Thebigmoney.com. 2010-02-03. Retrieved 2010-12-29. 1 2 Spangler, Todd (3 August 2016). "Time Warner Acquires 10% Stake in Hulu for $583 Million". Retrieved 8 August 2016. ↑ "Hulu's Billion-Dollar Milestone: A Sign Of Just How Far Behind Netflix It Has Fallen". Forbes. ↑ "Hulu Is Off and Running in Its Big, Fast-Talking New TV Commercial". adweek.com. 2015-10-19. Retrieved 2016-02-24. ↑ "Hulu.com Site Info". Alexa Internet. Retrieved 2016-10-04. 1 2 Kramer, Staci D. (April 30, 2006). "It's Official: Disney Joins News Corp., NBCU In Hulu; Deal Includes Some Cable Nets". Retrieved October 30, 2006. ↑ "Leadership – Discovery Communications, Inc.". corporate.discovery.com. Retrieved 2016-05-25. ↑ "Peter Chernin Offers $500M for Hulu". TheWrap. 2013-04-05. Retrieved 2016-05-25. ↑ "Free, Legal and Online: Why Hulu Is the New Way to Watch TV". WIRED. Retrieved 2016-05-25. ↑ Wauters, Robin. "We Happy? Miramax Deal Brings Hundreds Of Movies To Hulu Plus (And To Hulu)". TechCrunch. Retrieved 2016-05-25. ↑ Nat Worden (2007-03-22). "Google's Still on Top". TheStreet.com. Archived from the original on 2007-09-30. Retrieved 2007-08-29. ↑ Nat Worden (2007-08-29). "Google's New Foe: Hulu". TheStreet.com. Archived from the original on 2007-09-04. Retrieved 2007-08-29. ↑ "Hulu TV Ads: Alec in Huluwood". Hulu. Hulu. Retrieved May 10, 2009. ↑ McCarthy, Caroline (January 26, 2009). "Hulu to shock the world with Super Bowl ad". CNET News. Retrieved February 2, 2009. ↑ Brady, Shirley (August 29, 2006). "NBC and Fox Jump Through Hulu Hoop". Cable360.net. Retrieved 2007-08-29. 1 2 3 Lawler, Ryan (May 12, 2012). "It's Done: Early Hulu Investor Providence Equity Partners Has Sold Its Stake For $200M". techcrunch.com. Retrieved 2012-05-12. 1 2 Stelter, Brian; Stone, Brad (2010-04-05). "Hulu, the online-video hub, contemplates its future". The New York Times. Retrieved 2010-04-27. ↑ Grotticelli, Michael (2010-04-26). "Hulu plans subscription service". Broadcast Engineering. Archived from the original on 2010-07-04. Retrieved 2010-04-27. ↑ U.S. video viewing site Hulu plans an IPO: report Archived August 20, 2010, at the Wayback Machine. ↑ Dealbook (2010-08-16). "Hulu Is Said to Be Ready for an I.P.O". Dealbook.blogs.nytimes.com. Retrieved 2010-12-29. ↑ VASCELLARO (2011-06-21). "Website Hulu Considers Sale". The Wall Street Journal. Retrieved 2011-06-21. ↑ Parr, Ben (October 13, 2011). "Hulu Is No Longer For Sale". Mashable. Mashable, Inc. Retrieved June 14, 2013. ↑ Van Grove, Jennifer (January 31, 2012). "Hulu CEO Jason Kilar: Original programming is an important part of the agenda.". VentureBeat. ↑ "Mike Hopkins Named CEO of Hulu". Retrieved 17 October 2013. ↑ "Hulu confirms plan to stream live TV next year". The Verge. Vox Media. Retrieved 10 August 2016. ↑ "This is the end of Hulu as we know it". Washington Post. Retrieved 9 August 2016. ↑ Jarvey, Natalie (August 8, 2016). "Hulu to End Free TV Service". The Hollywood Reporter. Retrieved August 8, 2016. ↑ Brodkin, Jon (August 8, 2016). "Hulu will soon end its free streaming options". Ars Technica. Retrieved August 8, 2016. ↑ Brian Stelter, The New York Times. "Fox to Limit Next-Day Streaming on Hulu to Paying Cable Customers". July 26, 2011. Retrieved July 28, 2011. ↑ "Hulu BBC Deal, A Positive Step After Some Cloudy Times". CEOWORLD Magazine. 18 September 2013. ↑ "Hulu Makes Big Kids Programming Push With New Disney Channel Deal". Retrieved 17 June 2016. ↑ "The CW Bloodbath is Coming - Hulu Removing CW Shows September 18th". Exstreamist.com. 17 August 2016. ↑ Atkinson, Claire (2009-10-21). "Chase Carey: Hulu to Charge in 2010". Broadcasting & Cable. Reed Business Information. Retrieved 2009-11-08. ↑ Sandoval, Greg (October 22, 2009). "More signs Hulu subscription service is coming". Media Maverick. CNET. Retrieved November 4, 2009. ↑ Stelter, Brian (29 June 2010). "Hulu Unveils Subscription Service For $9.99 a Month". New York Times. Retrieved 12 November 2014. ↑ Stelter, Brian (27 November 2010). "Hulu Drops Prices to Compete With Netflix". New York Times. Retrieved 12 November 2014. ↑ Nakashima, Ryan January 13, 2012. "Hulu Plus ends year with 1.5 million subscribers". ↑ Stelter, Brian (4 May 2016). "Hulu closes in on 12 million subscribers; plans cable-like TV option". money.cnn.com. CNN. Retrieved 1 November 2016. ↑ Peterson, Tim (April 29, 2015). "Hulu Will Drop Hulu Plus Brand, Picks up 'Seinfeld'". Advertising Age. Retrieved September 13, 2015. ↑ "Hulu Explores Adding Ad-Free Option to Its Service". Wall Street Journal. July 16, 2015. ↑ "Hulu - About". Hulu. Retrieved 2015-04-08. ↑ Wallenstein, Andrew (2 September 2015). "Hulu Adds (Mostly) Ad-Free Subscription Service". Variety. Retrieved 2 September 2015. ↑ Dawn C. Chmielewski (26 Jul 2010). "Hulu's sharp decline in viewership underscores inconsistency in measuring size of online audience". LA Times. Retrieved 1 Nov 2013. ↑ Schonfeld, Erick (7 Feb 2011). "ComScore: Hulu Is Watched Twice As Much As The 5 Major TV Networks Online Combined". TechCrunch. ↑ Lafayette, Jon (May 2, 2016). "Digital Video Market Surges Into NewFronts". Broadcasting & Cable. pp. 16–17. ↑ Rebecca Dana and Emily Steel (2008-03-11). "Can Hulu Find Its Mojo With Viewers?". The Wall Street Journal. Retrieved 2008-03-19. ↑ "ABC to offer shows on Hulu". The Live Feed. April 30, 2009. ↑ Albanesius, Chloe (November 18, 2009). "Hulu, EMI Strike Deal for Music Videos, Concerts". PC Magazine. Retrieved 24 December 2009. ↑ Albanesius, Chloe (December 23, 2009). "Hulu, Warner Music Sign Deal for Music Content". PC Magazine. Retrieved 24 December 2009. 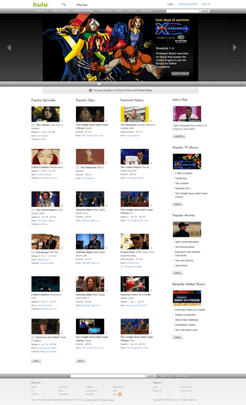 ↑ New York Daily News article: "Comedy Central's 'The Daily Show' and 'The Colbert Report' off Hulu." 1 2 Multichannel News article: "Dauman: Vivendi Could Return To Hulu." ↑ Liz Shannon Miller (2011-01-18). "New Series The Morning After Nudges Hulu Into Production". GigaOM. Archived from the original on 2011-07-21. Retrieved 2011-05-02. ↑ Rother, Larry, January 16, 2012, "Hulu Announces First Original-Script-Based Program". ↑ Poggi Jeanine January 27, 2012. Hulu Adds Unscripted Series 'The Fashion Fund,' Accelerating Original Content Effort." ↑ Perez, Sarah (April 19, 2012). "Hulu Announces Four More Original Series". TechCrunch. ↑ Wasserman, Todd (May 21, 2012). "Hulu to Launch New Show With Kevin Smith Plus 9 Other Titles". Mashable. ↑ "Hulu and South Park Announce Exclusive Multi-Year Content Licensing Deal at 2014 Television Critics Association Summer Press Tour - Business Wire". businesswire.com. ↑ "South Park - Watch Full Episodes, Clips & More". southparkstudios.com. ↑ "South Park - Watch Full Episodes, Clips & More". cc.com. ↑ "Netflix removes South Park and other titles from its library". Know Your Mobile. ↑ "South Park – New Site FAQs". cc.com. ↑ Smiley, Minda (May 14, 2015). "AT&T strikes deal with Hulu to offer subscription service to its customers". The Drum. Retrieved May 14, 2015. ↑ "Viz Debuts Neon Alley". Retrieved 8 August 2016. ↑ "Stream Naruto, Sailor Moon & More: VIZ Media Partners with Tubi TV to Deliver Free Anime". Tubi TV. July 21, 2016. Retrieved October 1, 2016. ↑ "Why can't I use Hulu internationally?". Hulu.com. Retrieved 12 June 2015. ↑ "Nippon TV Acquires Hulu Service in Japan". Businesswire. 2014-02-27. ↑ "Hulu launches its first overseas operation in Japan". Asia Pacific Arts. 2011-09-01. ↑ Garrahan, Matthew. Hulu eyes launching global pay platform, Financial Times, July 8, 2010. Retrieved July 11, 2010. ↑ Laughlin, Andrew. Hulu 'puts UK launch back on agenda', Digital Spy, July 9, 2010. Retrieved July 11, 2010. ↑ "Summary Box: Hulu launches video subscription service in Japan". Washington Post. September 1, 2011. Retrieved September 2, 2011. ↑ Mudhar, Raju (4 January 2016). "Why these five well-known online services snub Canada". thestar.com. Toronto Star. Retrieved 1 November 2016. ↑ "Answerman - Life Is Just A Game". Retrieved 8 August 2016. ↑ "Mindy Project staying on City despite being dropped by Fox". Toronto Star. Retrieved 27 September 2015. Look up 葫芦 in Wiktionary, the free dictionary.